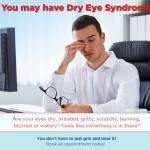 Home » What's New » What Causes Dry Eyes? Dry eyes are a common condition that leads many people to seek care and treatment from their local eye doctor. Due to an insufficient tear quantity or quality, the irritating symptoms include redness, stinging and constant blinking or eye rubbing. These symptoms can range from mild to severe, depending upon the individual. Yet, no matter what type of irritation you experience, dry eyes can disrupt your comfortable vision and interfere with daily life. If you suffer from dry eye syndrome, our eye care specialists can help relieve your pain. Learn more below. Atmosphere: extreme weather – such as frigid temperatures or very arid conditions, can place stress on your eyes, preventing them from making enough lubricating tears. In these surroundings, goggles or wraparound sunglasses can help protect against dry eyes. In very hot climates, staying well hydrated may also help. Smoke, wind and dust may also cause dry eye irritation. A/C or heating: air-conditioning, heating and fans are all associated directly with drying out your eyes. To counter this problem, it’s worthwhile to invest in a humidifier. Allergies: seasonal allergies have been shown to have a powerful impact on eye moisture. When the pollen count is very high in our area, many of our patients complain about dry eye symptoms. An indoor air filter may be the best way to solve this problem. Blepharitis: this skin condition affects the tissue along the edge of your eyelids. Caused generally by blocked oil ducts, blepharitis affects your eye’s ability to produce healthy tears. Rosacea is another skin condition that may block your eyes’ oil glands. Inadequate tear quantity: a decrease in the amount of tears that your eyes produce can be due to many different reasons. Officially called keratoconjunctivitis sicca, this condition may be improved by taking omega-3 fish oil. Aging and health: this is another typical cause of insufficient tears, as well as specific medical conditions – including lupus, diabetes, rheumatoid arthritis, thyroid conditions, Sjorgen’s syndrome, scleroderma and vitamin A deficiency. Undergoing LASIK may also be to blame. Side effects of medication: weak tear production may also be caused by certain drugs. Be sure to tell your eye doctor about any medical treatments or therapies you are taking. Although dry eye tends to be a chronic condition with no cure, there are many effective treatments that can alleviate the discomfort. Our eye care providers are experienced and knowledgeable about this condition, and we’ll work with you patiently to manage your dry eye syndrome. Artificial tears or lubricant eye drops, which compensate for your lack of natural tears. Check with your eye doctor regarding the best brand to use for your condition. Heated compresses to open up clogged tear ducts, especially if you suffer from Meibomian gland dysfunction. Punctal inserts may be prescribed to treat severe dry eyes. Placed inside your lower eyelid, these inserts gradually release lubrication as the day goes on. Punctal plugs may help with extreme cases. During a quick, in-office procedure, our eye doctors will insert tiny silicone plugs into the corner of your eye to block drainage, which helps tears to disperse better across the eye. Changing the type of contact lenses that you wear. Some types of contacts can dry out eyes, while others can help maintain moisture and resolve the symptoms. Dry eye syndrome requires constant treatment to keep the irritating symptoms from flaring up. Our optometrists will help design a long-term, efficient strategy to restore your comfortable and healthy vision.